Since I am essentially a basic b, I love fall and layering for the cool weather. I grabbed this dress out of the back of my closet today and at first threw a coat on top. I didn't really want to cover up the dress, so I decided to try layering under the dress. This chambray top is so versatile, and it kept me perfectly warm in the dropping Autumn temps. You may have noticed something else, I gots me some bangs! I have wanted to make the snip for a while, but I was waiting until it got colder. Who wants to deal with sweaty bangs in the summer?! I love them! Here in Indiana we are smack dab in the middle of that three week period where the leaves are changing into beautiful yellow, reds and oranges. In a few weeks I will be cursing the seasonal change as I am raking my yard, but I still have a bit more time to enjoy the beauty that is a Midwestern Autumn. I wore this casual outfit for lunch with a girlfriend earlier in the week. I typically wear leggings and high boots with this poncho, but I decided to go really laid back and wear my ripped boyfriend jeans and leopard print slip on flats. After a delicious lunch at my new favorite Mexican restaurant I was loving the poncho, but regretting my decision to wear jeans without stretch! Lesson learned- one does not simply wear tight jeans out to Mexican. One of the best feelings for me is when I see a crazy beautiful outfit on a fellow style blogger, on TV or in a magazine and realize I have all the pieces to recreate it! I was scrolling through my insta feed the other day and saw this picture from A Lily Love Affair. I just loved it! Not only did I think the combination was fabulous, I instantly knew I had the white tulle skirt, polka dot top and patent red heels to pull it off! I decided to be a complete copycat and make this look my own. 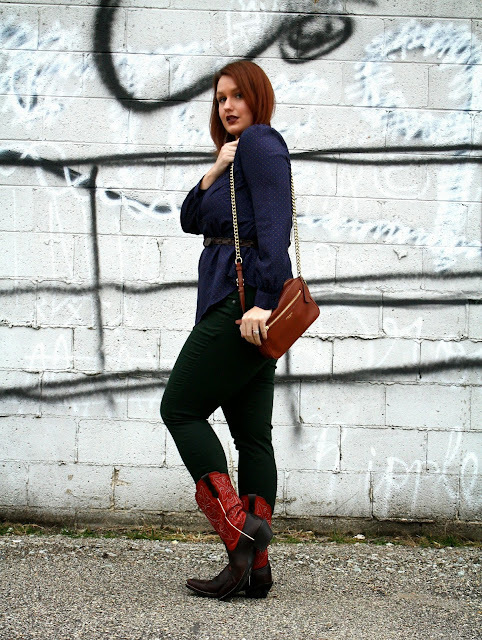 Getting inspired by other stylish women is such a fun part of being a style blogger! I've had the same weekday morning routine for over a year. I get up around 5:15, head to the gym for a group fitness class at 6 and get to work around 7:45. It's a great way to start my morning, but it does come with its share of complications. Each night before bed I pack my gym bag with the outfit I will wear to work the next day. I like to plan my outfits out in advance, and sometimes they are a big win and sometimes... Well, let's just say this outfit looked a whole lot better in my head then it did once I put it on in the gym locker room. Unfortunately, I don't have enough time to run home and change before work, so on days like this I am stuck with the outfit I picked out. In my head it seemed to all work. The combination of olive and dusty rose seemed great. Pairing casual booties with the feminine pleated skirt? Total win. Using chambray as a neutral to anchor to look? Yup! But on it seemed off, I think mostly due to the proportions and cuts of the garments. I flirted with the idea of not even photographing it, but this blog is all about my personal style: the good, the bad and the ugly! Even though the calendar says October, it seems that someone has forgotten to tell Mother Nature to hurry it along with those cooler temps! Here in Indiana we are going back and forth between unseasonably warm days and those frosty pre-winter mornings that make you want to curl up in a warm poncho. 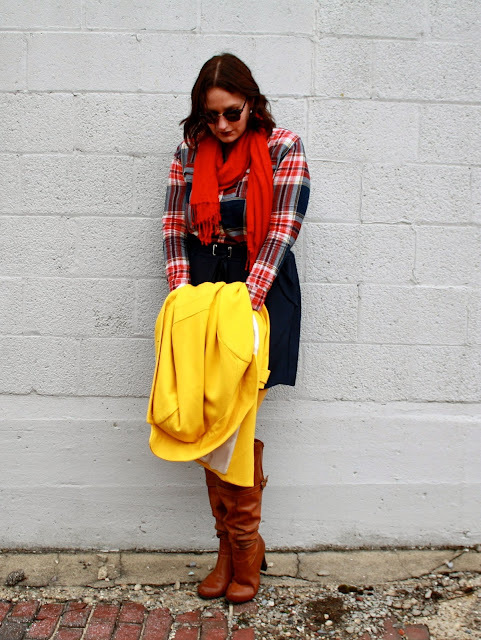 This look combines two of my fall favorites: buffalo plaid and ponchos. I can dress it up with a nice dress and boots and go casual in jeans. It's a real superstar for this season. Like a moth to a flame, so is a style blogger to graffiti. We just have to do it I guess, it's in our blood! 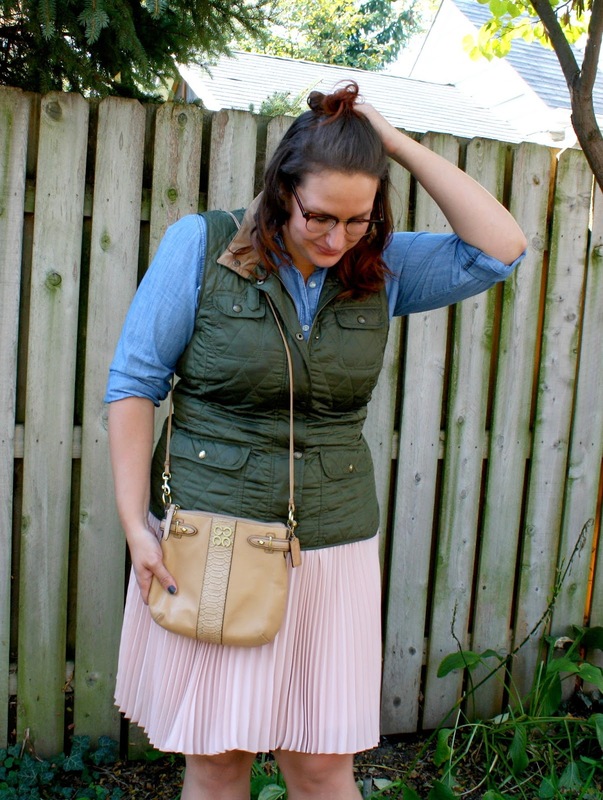 I've talked about styling this skirt before. I absolutely love it, but for some reason it's difficult for me to style. I don't know if it is the color or the pleats that trow me off, but I alwards find myself second guessing whatever I put with it. I don't want to make it too easy and throw a basic top with it, but I seem to stare at my closet for a long time trying to find it's perfect match. I got some good style hints from you all on insta, but if you have any other thoughts about styling this skirt helps a sista out! Let's take a second to talk about the magic that is this poncho. It is essentially a large cashmere blanket gifted to me by Scot after returning from a business trip to Germany. When he brought it home for me several weeks ago it was far too warm to leave the house in what is, for all intents and purposes, a classy Snuggie. In order to keep it somewhat formfitting I layered a chunky belt over the front flaps, and I let the back stay open to create a poncho/cape hybrid. I don't have many of these bad boys in my collection, but after rereading this post from last year I see that the last poncho I acquired was similarly bought for me by my husband. Babe, what the heck? Why do you keep buying me ponchos? Are you trying to turn me into a weird poncho lady instead of a weird dog lady, because I am totally game! 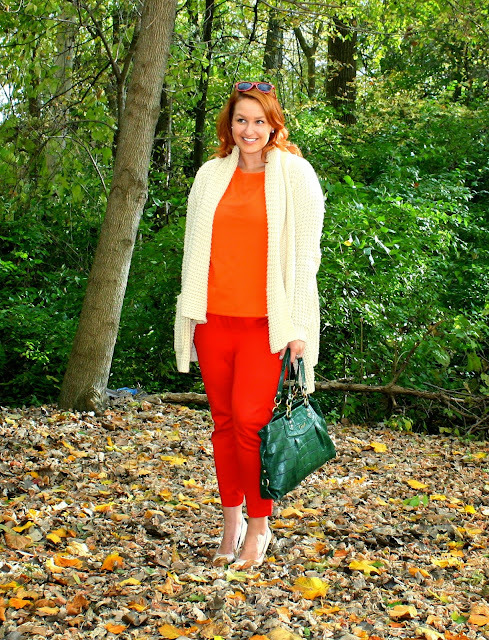 It's fall, and for people who love style that essentially means it's our Christmas! Cozy sweaters, rich colors and great textures all come together to form one perfect seasons of style. Before we have to cover everything with heavy coats, let's take a look at some of the best fall looks featured on In Kinsey's Closet for Autumn 2015. Click the pictures to be taken to the original post!